Knit and Knatter Project – You can't buy happiness, but you can buy coffee. 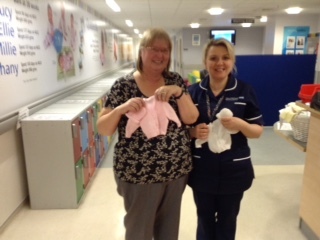 Pat’s Knit and Knatter group have been knitting items for the premature baby unit each Friday afternoon in the coffee shop. Pat, Keith and Margaret delivered the items to St Mary’s Hospital last week. They have been knitting for weeks and their donations were greatly appreciated at the hospital. Well done ladies! You’re fab! Previous Post Volunteer of the Month!